Note: You can easily change any text and fonts are free! 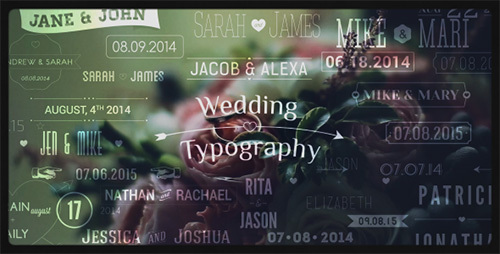 Hello everybody, It’s Wedding Typography Titles Pack. It brings your wedding clips to the next level and clients will be impressed. Just add it, and you’ll see the magic. Slideshow for photoes and videos! 4 After Effect projects: Combined titles ( ready-made ), dates&names, dates, names.